The results are in. On Thursday, the American team dominated in the women's individual all-around gymnastics finals at the 2016 Rio Olympics, with Simone Biles and Aly Raisman taking home the gold and silver medals, respectively. When 19-year-old Biles, who was widely considered the best gymnast alive even before the Olympics began, was crowned the winner of the event, she gave Raisman a big ol' hug, and pulled her onto the stage as the two Americans shared the spotlight together. Aliya Mustafina of Russia placed third. While Biles' victory wasn't an enormous surprise, it wasn't a foregone conclusion, either. Halfway through the finals, Mustafina was in first place, with Biles in second and Raisman third. But they both finished strong, and edged out Mustafina in the second half. Biles finished with a score of 62.198, while Raisman closed out with 60.098. It was something of a repeat performance for Biles and Raisman, as the two had won the gold medal in the team gymnastics event earlier at Rio. There was a strong sense of camaraderie between Biles and Raisman, despite the fact they were ostensibly competing with one another. After the final scores were announced, they shared a long, heartfelt hug and posed for the cameras, hands locked together triumphantly. Even though this wasn't a team event, they very much treated this as a collective victory for them and the U.S. team. Biles' victory was widely expected. Even before the Olympics began, she was quickly gaining a reputation as the greatest gymnast alive, and perhaps ever. Mary Lou Retton, a legendary gymnast in her own right who won the 1984 all-around gymnastics gold medal, said in 2014 that Biles "may be the most talented gymnast I've ever seen in my life," adding that she's "in her own category." With this gold medal victory, Biles became the fourth consecutive American woman to win the all-around title. She's also won the last three all-around titles at world championships, for a total of 14 medals, including 10 gold. 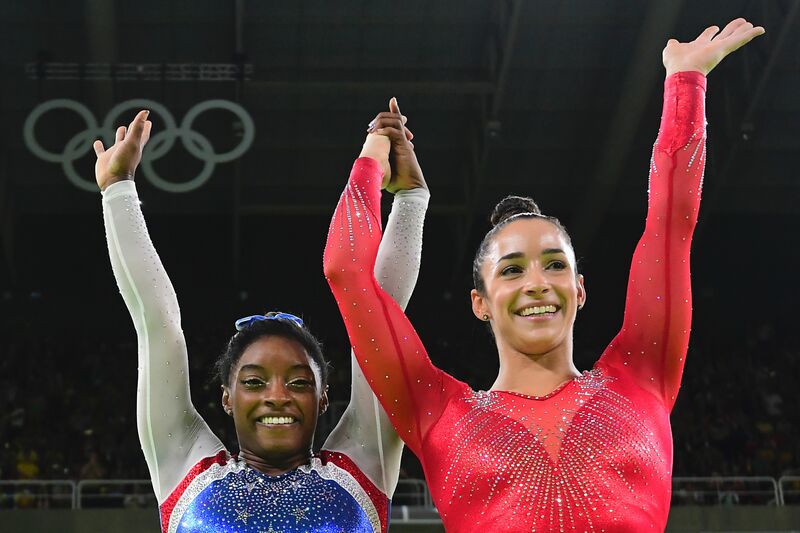 Raisman, meanwhile, said earlier in the week that she not only expected Biles to win gold — she hoped for it, too.